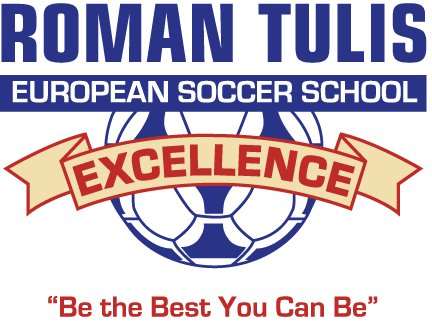 Now that the Roman Tulis European Soccer School of Excellence is into its 22nd year, it’s not surprising that many of the original cast of players are now hanging up their boots – professionally at least. However, the end of their era is good news for the next generation of players, with many Alumni returning to coach in the Vancouver area. In addition to the Tulis alumni on the current Roman Tulis coaching staff – Nicole Tulis, Caedyn Lennox, Tim Ainge (2009 School Boy), Kiefer Donnelley-Sui (2010 School Boy), Andrea Perrotta (2011, 2012, and 2013 School Girl), Ari Nitikman, Julian Gailiunus, Rukshila Dufault (2010 School Girl), and Colin Streckmann (2005 School Boy and Hall of Fame member) – many of our former players are coaching across the lower mainland. With the ubiquity of information in the internet age, it’s becoming easier than ever to track the exploits of our players across the world. Almost every week, our alumni are featured in the news for their on and off-field exploits. 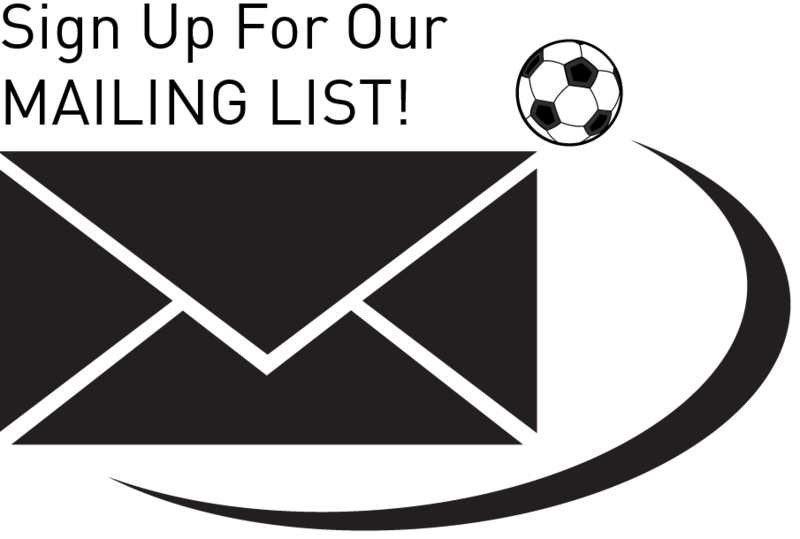 It is also becoming possible to measure their performance against the rest of the world, with websites such as transfermarkt.net providing summaries of their goals, assists, and market values. According to a recent search on the popular player information database, the combined transfer market value of Tulis alumni is about €1.5 million – just north of $2 million Canadian dollars! However, beyond simply reading about them, technology offers even more exciting ways to interact with our Alumni. 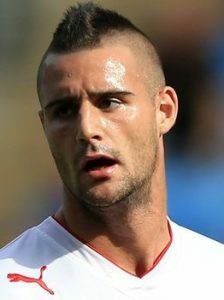 For example, Marcus Haber (2005 School Boy and Hall of Fame member – see picture left) is a striker for Crewe Alexandra in League 1 in England, and is available as a player in EA Sports FIFA 15 video game. His high “Strength” (84) and “Beast” (80) ratings should see him selected to the virtual teams of many of our current Tulis players. Other players likely to be added to FIFA video games in the future are Mason Trafford (Hall of Fame member – see picture right) and Michael Nonni (2006 School Boy – see picture left), both defenders in the North American Soccer League. 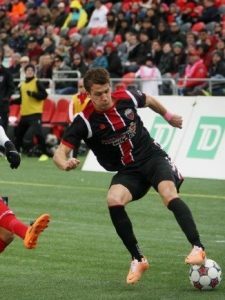 Mason made his return to Canada in 2014 with the Ottawa Fury after spending an interesting 2013 campaign playing for Guizhou Zhicheng FC in the southern Chinese province, Guizhou. Michael is in his third year with FC Edmonton, an ever-present in a side that finished third in 2014. 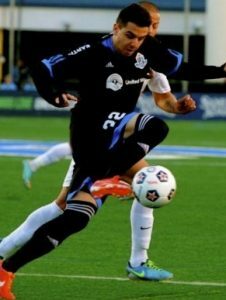 Although a few years younger than this pair, Daniel Stanese, a member of the 2007 European Tour that won the Dana Cup and placed third in the prestigious Gothia Cup, is also making a name for himself in the professional game. Having joined FC Ausburg II in Germany last year, his solid performances as a centre-back have earned him numerous call-ups to Canada’s U-20 national team, culminating in a promotion to the senior national side for two friendlies against Iceland this month (January 16th and January 19th). While he has been involved in professional football for several years now, 2014 was somewhat of a breakout year for Tulis alumni Lucas Menz. Lucas, a goalkeeper (see picture left), was part of the 2004 European Tour when he was just 14 years old, getting his first taste of European football in the form of a 2nd place finish at the St. Andrews International Football Festival in Scotland (picking up a win against professional side Dundee United along the way!). 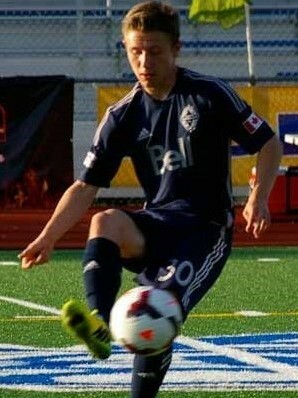 Since then, he has gone on to play with Quest University at the collegiate level, Whitecaps U-23, Ebbsfleet United in England, and Wormatia Worms in Germany. 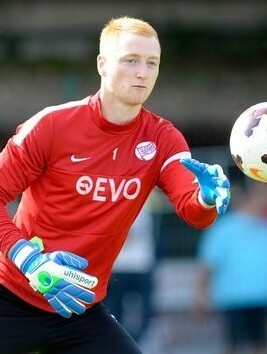 His impressive form at Wormatia prompted his current club, Kickers Offenbach, to take a chance on the Canadian. Kickers Offenbach currently play in the German 4th division, located in Offenbach am Main, just a short drive from Frankfurt. Founded in 1901, their long history has included several seasons in the Bundesliga during the 70s and 80s, as well as relegation outside of the professional football pyramid in the early 90s. Currently, they are a club on the rise, leading the Regionalliga Südwest with 49 points from 20 games, making them strong favourites for a promotion to the 3rd division next season. More remarkable than their league form this season, however, have been their performances in the DFB-Pokal, the German Cup. Like its English counterpart, the FA Cup, the DFP-Pokal pits all levels of German football against one another, paving the way for the rare “giant killers” of the lower leagues to eliminate teams in the top divisions. Lucas and his teammates made headlines when they took down FC Ingolstadt of the 2nd Bundesliga in a nervy penalty shootout following a 0-0 draw. They secured their next scalp with a 1-0 victory over another 2nd Bundesliga opponent, Karlsruher SC, sending them into the Round of 16. Their next challenge is Borussia Mönchengladbach, a team currently ranked 4th in the Bundesliga – that match is scheduled for either March 3rd or 4th. 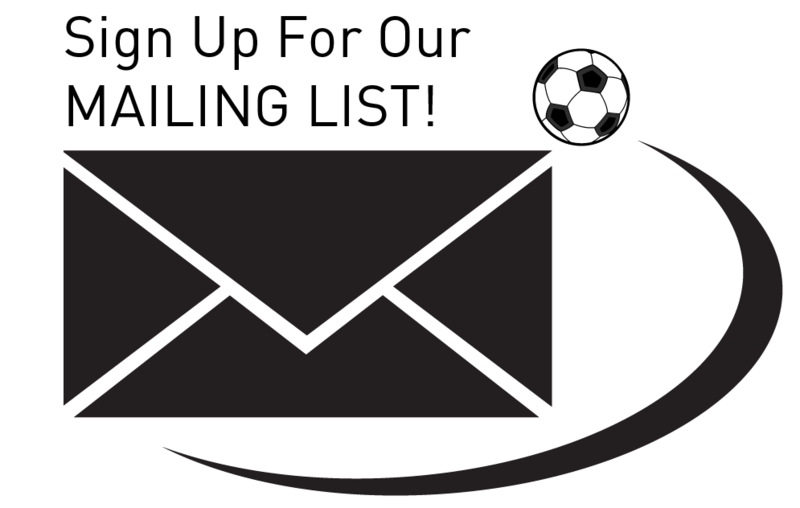 Check our Facebook page, www.facebook.com/RomanTulisSoccer, regularly for updates on Lucas’s progress and for details on how to watch that historic fixture once broadcasting schedules are announced. We have several young players training alongside Europe’s elite as they seek to carve out a career for themselves. 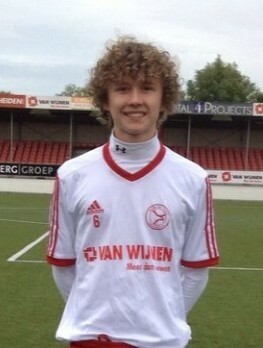 Tim Solinger (see picture left)joined up with the U-16 side of Almere City FC of the Eerste Divisie (Dutch 2nd Division), setting him on course to join the ranks of world-class midfielders that have come through the Dutch youth system over the years. 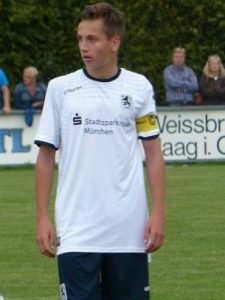 In neighbouring Germany, Matthew Durrans (see picture right) earned a spot on TSV 1869 Munich’s U-17 team in August of 2013. Playing in the South/Southwest region of the B-Junioren Bundesliga, Matthew has shown over the past year and a half that he can compete with the best young players from top sides such as FC Bayern Munich and FSV Mainz 05. Diego Villavicencio is enjoying life in the warmer climes of Spain, representing Madrid-based side AD Colmenar Viejo’s U-19 team. Diego is no stranger to life abroad, having spent training stints in Mexico with Pumas and Club America over the past few seasons. 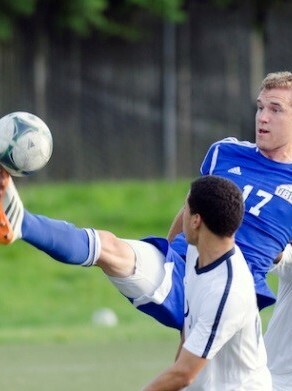 As always seems to be the case, the Canadian university soccer scene was dominated by Tulis alumni, with several former players leading the formidable UBC Thunderbirds and SFU Clan to successful seasons. 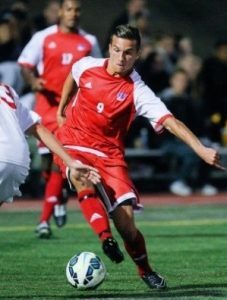 Jovan Blagojevic (see picture left) (2007 School Boy and Hall of Fame member) captained SFU’s Men’s Soccer Team during 2014, scoring a league-leading 18 goals in 18 games to earn GNAC & West Region player of the year awards, as well as a spot in the highly coveted All-America team. And while it’s been 5 years now since Jovan last trained with the school, his continued contributions as a coach as well as his impressive on-field performances saw him inducted into our Hall of Fame at our Christmas party in December. Also at SFU is a more recent graduate, Adam Jones (see picture left), who made a name for himself while with the Whitecaps Residency program over the last few years. Meanwhile over at UBC, Niall Cousens (see picture right) (2006 School Boy), Paul Clercand Andrew Grange were mainstays of a perennially-strong Thunderbird side. Niall bagged 7 goals and 5 assists as a striker, terrorizing defenders with his pace, technique, and imposing 6’4” frame. Paul, the team’s captain, notched 2 goals and 2 assists as a centre back. If you read our annual report last year, you would know that Paul is also a distinguished scholar, earning the Governor General’s All-Academic Commendation in 2013 for his superior academic and athletic performance. Graduating this spring, he hopes to start medical school in the fall. Andrew, who has a few years of eligibility left with UBC, is faced with the difficult task of replacing Paul’s physical presence on the Thunderbird backline. However, given that he turned down the opportunity to play in the Bayernliga, the top tier of amateur German football, to play for UBC, he certainly has the quality to do the job. Not to be outdone by the boys, Tulis alumni Pamela Villavicencio (see picture left, in the middle) and Christine Zwimpfer (see picture right) (2011 School Girl) have also excelled on the varsity stage. Pamela saw limited playing time in her freshman year with the University of North Florida Ospreys, but impressed from midfield against tough NCAA Division I opposition when called upon. 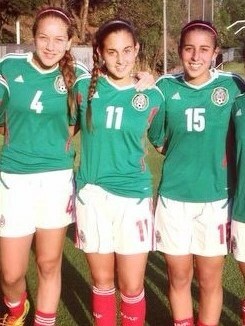 Her performances caught the eye of soccer officials from her native Mexico, earning her a call up to the Mexico U-20 Women’s National Team training camp. 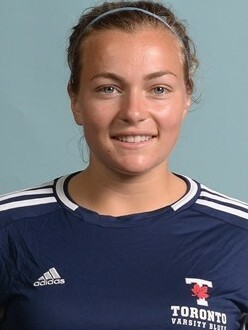 Christine (pictured right) plays north of the border for the University of Toronto Varsity Blues, leading her team to a 3rd place finish in the competitive Ontario University Athletics East Conference, scoring 3 goals in the process. While their sports might no longer be soccer, Michael Belle (see picture left) and Gabriel Ho-Garcia (see picture right) (2010 School Boy) continue to demonstrate their superior athleticism and work ethic by competing at an elite level in golf and field hockey respectively. Michael finished his golf career at SFU in 2014, captaining the team in his senior year. 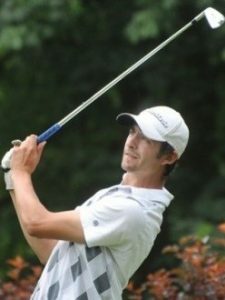 Since then, he has gone on to place 2nd in the British Columbia Men’s Amateur Championship, qualifying him for the Canadian Men’s Amateur Championship where he made the cut in a difficult field. 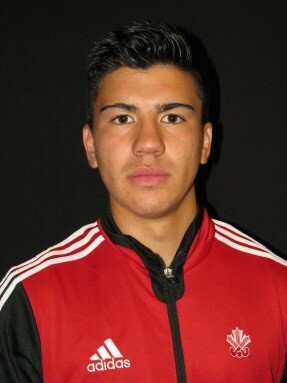 Gabriel has emerged as a leader on the Canadian Men’s Field Hockey Team after several years with the program. At the Champion Challenge 1 in Kuantan, Malaysia, he led Canada to its best-ever performance at the tournament, finishing second after losing to a tough South Korean team in the finals.